TNPSC Drug Inspector And Junior Analyst Govt Job 2019 Syllabus Check Here. TNPSC Notification is out. TNPSC is recruiting for 49 Drug Inspector And Junior Analyst Govt Job Posts. You can check TNPSC - Tamil Nadu Public Service Commission last date, download TNPSC notification, visit TNPSC official website and check other TNPSC Vacancy details.Complete Vacancy and recruitment Details about 49 Drug Inspector And Junior Analyst Govt Job vacancies in TNPSC are provided below by JobSarkari.Com only for you. Last Date of Apply Online. 12/05/2019. Date of Written Examination. 23/06/2019. Junior Analyst. Rs.150/- Rs.150/- No Fee (Those Who Have not Availed Three Free Chances). Drug Inspector. Rs.150/- Rs.200/- No Fee (Those Who Have not Availed Three Free Chances). For Both Posts. Rs.150/- Rs.200/- No Fee (Those Who Have not Availed Three Free Chances). Mode of Payment. Candidate Can Pay Fee Through Debit Card, Credit Card, Net Banking or E Challan. Drug Inspector. Candidate Must Have Passed Degree in Pharmacy or Pharmaceutical Science or Medicine With Specialization in Clinical Pharmacology or Microbiology. 23/06/2019 At 10:00 A.M. to 01:00 P.M. 40. Junior Analyst. Candidate Must Have Passed Degree in Pharmacy or Degree in Pharmaceutical Chemistry or Degree in Chemistry And Having 1 Year Experience in Related Field 23/06/2019 At 02:30 P.M. to 04:30 P.M. 09. 2. Candidate Can Click on the Registration Link As Given on our Website in Important links Section. 3. Candidates are Required to Fill All Basic Details Carefully Such as Name, Mobile No And E Mail ID. 5. After Save the Data System Will Generate the Registration Number And Password As Displayed on Screen as Well as Through SMS and E-Mail. 6. After Successful Registration Candidate can Log In with Registration No. and Password for Payment of Application Fee. 7. Online Application can be Submitted on or Before 12th May 2019. Q. What is the Last Date For TNPSC Drug Inspector And Junior Analyst Govt Job Vacancy ? A. 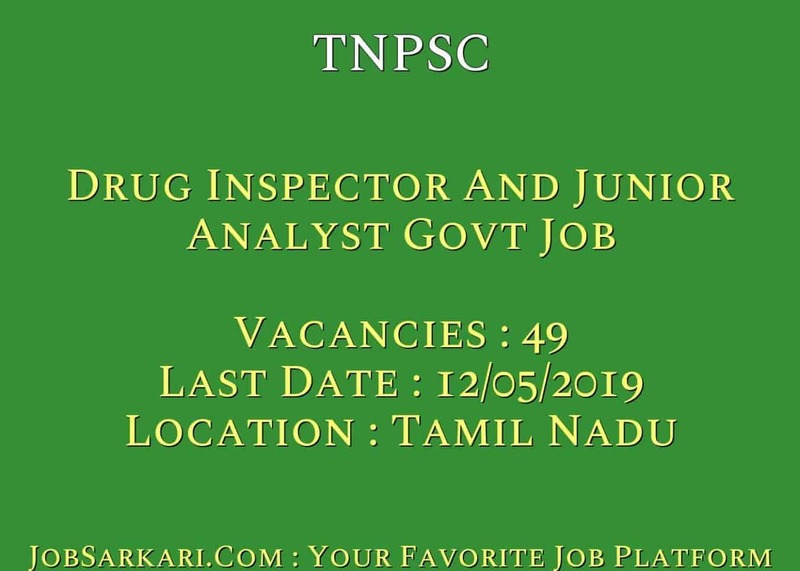 Last Date for TNPSC Drug Inspector And Junior Analyst Govt Job Posts is 12/05/2019. Q. What is the Form Type of TNPSC Drug Inspector And Junior Analyst Govt Job Recruitment ? A. The Form Type for TNPSC Drug Inspector And Junior Analyst Govt Job Posts is Online. Q. 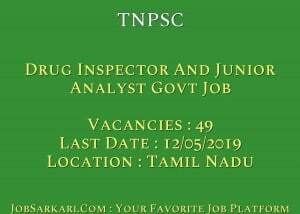 How many vacancies are available in Tamil Nadu Public Service Commission Drug Inspector And Junior Analyst Govt Job Posts ? A. There are about 50 Vacancies in Tamil Nadu Public Service Commission Drug Inspector And Junior Analyst Govt Job Posts. All posts are available in tamil nadu only.